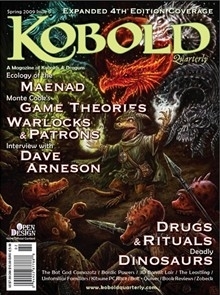 Kobold Quarterly #9 features an interview that unfortunately is sad and all-too-timely: the last interview with Dave Arneson. Plus dinosaurs, bard magic, magical oaths, ritual drugs, and warlocks! It's a full heaping helping of great game material to inspire any 3E/OGL or 4E fan to play a better game and enjoy both the history and the future of the hobby. This title was added to our catalog on April 08, 2009.